It was wonderful to see all of you who returned to Columbia for our 45th reunion. For those who passed it up, you missed an event that has been described to me as “thoroughly enjoyable,” “totally exhilarating,” “truly memorable,” “a great success,” “exceeded expectations.” A special thanks to all of you who worked on the reunion committee. The weekend started on Thursday at a cocktail reception at the Columbia Club. I had a chance to talk to several classmates I hadn't seen since graduation, including Alan Jacobs who I discovered had shared my old profession -- making documentary films. It’s a shame our paths never crossed. I changed careers over 20 years ago, but Alan struggled on quite successfully and wound up as a founding trustee of the Sundance Institute and in charge of the LA office of Hallmark Entertainment. Most recently he has taught film courses at California State University at Long Beach. I hope he and others I talked to at the reunion will send me notes about the fascinating things they have done (and are doing), and I will include them here and on our web site, www.cc63ers.com. You can see pictures taken by the College photographer at the cocktail reception by clicking here. On Friday evening 100 classmates and guests cruised up and down the East and Hudson Rivers and around New York Harbor on the aptly-named “Romantica.” We had the boat to ourselves for this dinner/cruise and it proved to be a great time to meet and reconnect with old friends. Here are some shots of the revelers (and send me some of yours and I will add them here). For most of us Saturday lunch was the first chance we had to see the inside of the Trustees’ Room in Low Library. Instead of a speech we all took turns introducing ourselves and relating a brief description of our accomplishments. As one classmate wrote me, “I was just fascinated and awed by [our] individual and collective achievements.” It seemed that everyone had a book that was in the top three in its category on Amazon. Frank Partel has been inspired to accept the challenge and do a rewrite of his novel and overcome its 62nd rejection in order to join his classmates in the “Amazon Author’s Club.” Here are some candids from the College Reunion web site, and some pictures that I took. Our Class panel, “Liberty vs. Security: Critical Balancing Act,” put together by David Alpern, brought together a panel of experts with varying views on anti-terrorism and the Constitution. Surprisingly, they all seemed to agree that our government only seemed to be making things worse. 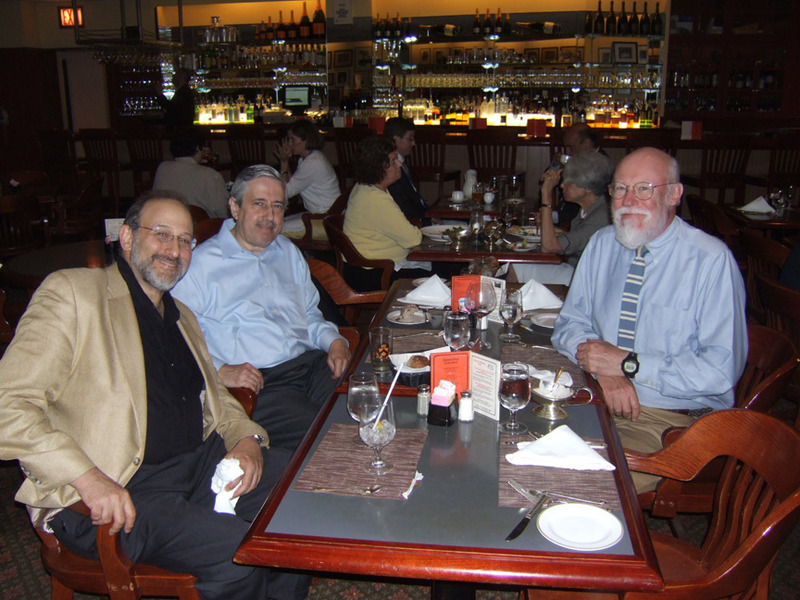 Here are some pictures I took, and some from the College Reunion web site. Saturday’s Class Banquet was highlighted by Bob Kraft’s generous donation and matching challenge for our Class Gift, which I will report on later. Both Dean Austin Quigley and his wife and Dean Derek Wittner attended. Ann McDermott, the Esther Breslow Professor of Biological Chemistry and Associate Vice President for Academic Planning and Science Initiatives gave the dinner speech and filled us in on the new Interdisplinary Science Building now being built at the North West corner of the Campus. Here are some pictures that I took (and you can find much better ones on the College Reunion site by clicking here). 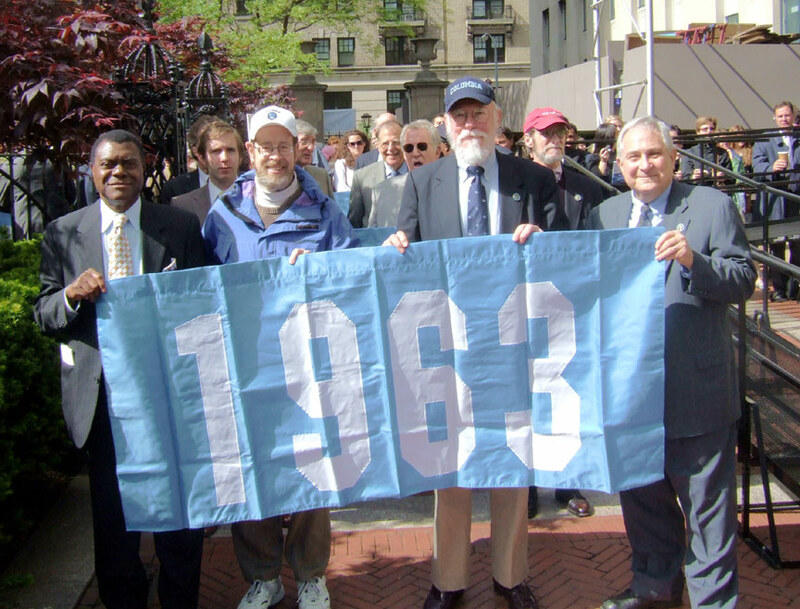 Onwuchekwa Jemie, Don Margolis, Paul Neshamkin, and Larry Polsky proudly holding the Class of 1963 flag. Earlier in May, Class Day was held on a glorious spring day on the Columbia campus. The Parade of Classes continues as great tradition and this year Don Margolis and I were glad to see two classmates join us to hold up the 1963 banner -- Onwuchekwa Jemie returned to see his daughter, Ijeoma Jemie graduate as a member of the Class of 2008, and Larry Polsky also returned for the graduation of his daughter, Alexandra. Two days latter, Larry and Onwuchekwa joined me as Anniversary Year marchers in the Academic Procession at Commencement. As we waited in Low Library, Larry and I reminisced about some of the memorable professors we had, and he promises to send me some Polycarp Kusch stories. Onwuchekwa plans on returning to Nigeria as a journalist after a distinguished academic career in the U.S. He also promises to tell me more about his life after graduation. 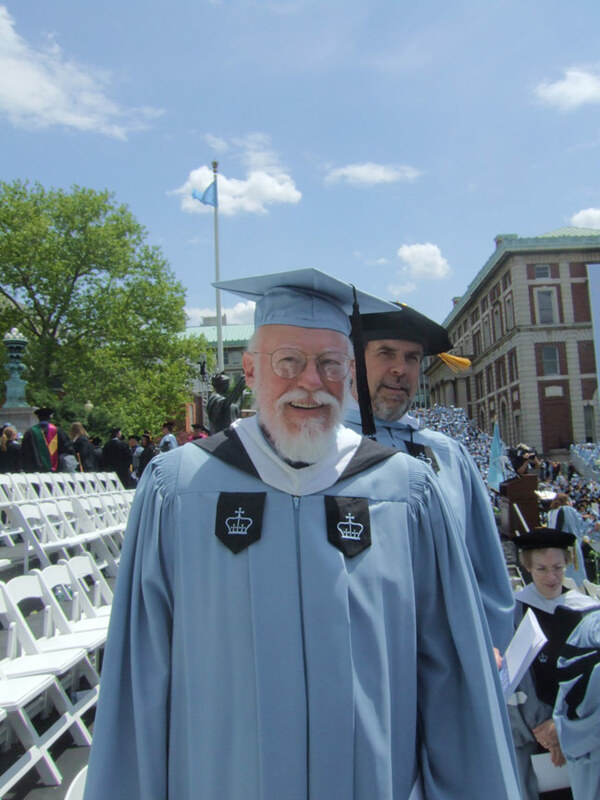 We all had the best seat in the house as we watched the exercises from the steps of Low along with the faculty and administration – all in full academic regalia. It was a thrilling experience. 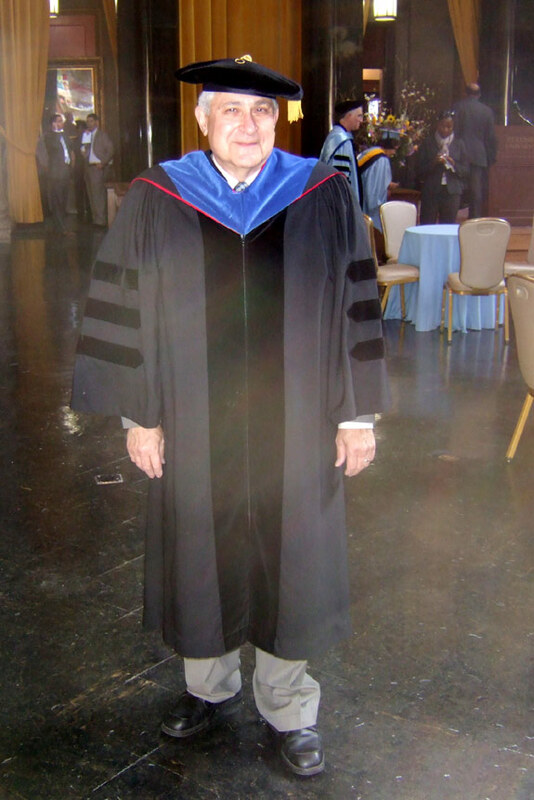 Larry Polsky in his full regalia. Paul Neshamkin in his Columbia Blues. Please join your classmates for an informal lunch at the Columbia Club every second Thursday of the month. It is our hope that these gatherings will renew old friendships and foster improved relationship with our class and the College. I hope you can all join us at the next lunches on Thursday, September 11 and October 9. Let me know if you will attend so that we can reserve a big enough table; RSVP to Paul Neshamkin (pauln@helpauthors.com). 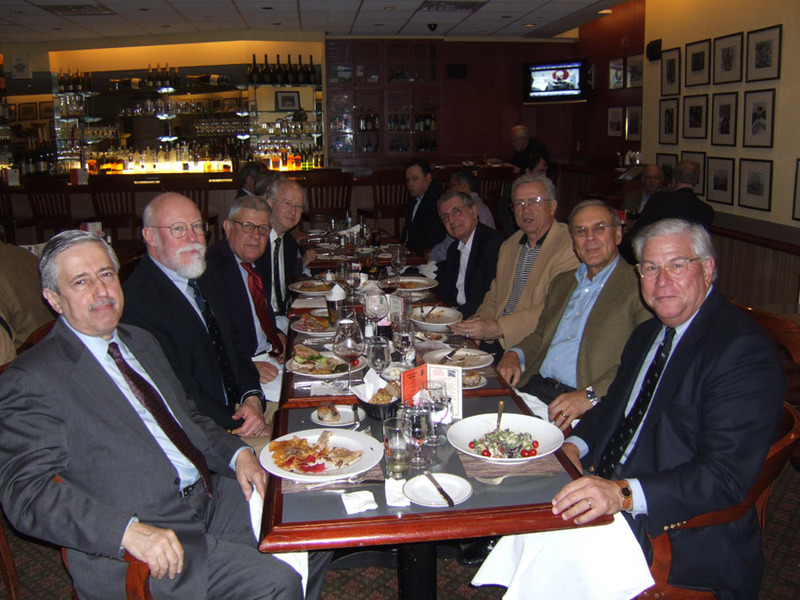 A large, enthusiastic group of '63ers met for lunch on May 8 (just 3 weeks before our 45th Reunion). Ben Tua visiting from Washington D.C. and Doug Anderson, back up from Palm Beach, joined regulars Jerry Dwyer, Doron Gopstein, Paul Neshamkin, Tom O'Connor, Barry Reiss, and Phil Satow. (Seated from left to right) Doron Gopstein, Paul Neshamkin, Ben Tua, Jerry Dwyer, Barry Reiss, Tom O'Connor, Phil Satow, and Doug Anderson. It’s great to see that we are still sending our children to the College. Congratulations to Harvey Cantor on the admission of his daughter, Elizabeth. 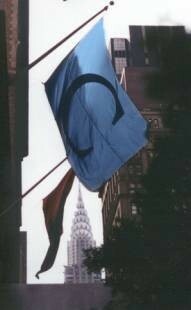 And of course, many of our children are guarantying that another generation will (hopefully) go to Columbia. Steve Barcan’s new grandson, Abraham Leo Barcan, was born to son Daniel and his wife Leah. Steve could only make the cruise on Friday before running up to Boston to meet the newborn. What class will he be in Steve? Gary Rachelefsky has been named the head of the National Asthma Campaign, a 501c3 organization dedicated to making quality care available to all patients with asthma through education -- teaching persons with asthma, clinicians, educators, and employers how to recognize and properly manage asthma -- reducing the cost of asthma and reducing school days missed, lost work days. Phil Satow, our Reunion Class Gift chairman announced at the Saturday Class Dinner that we had almost reached our goal of $250,000. After Bob Kraft’s additional donation of a matching gift, our class rose to the challenge in the final month of the fiscal year to put us over $365,000 -- a new, all-time 45th Reunion record. Final numbers are not in, but we did not reach our participation goal of 45% -- or even break 40%. Let’s aim to improve and break 50% for each year leading up to our 50th! I will include more of the news that I gathered at the reunion in future class notes. In order to make sure that what I print is accurate (my memory being what it is) I ask you to please send me more details. And if you missed this reunion, plan on making the 50th. In the meantime, let us know what you are up to, how you’re doing, and what’s next.